Hamo Thornycroft was an important sculptor spanning the later Victorian and the Edwardian ages, and with a large number of public commissions to his name. He was born in London but spent his youth in Cheshire. 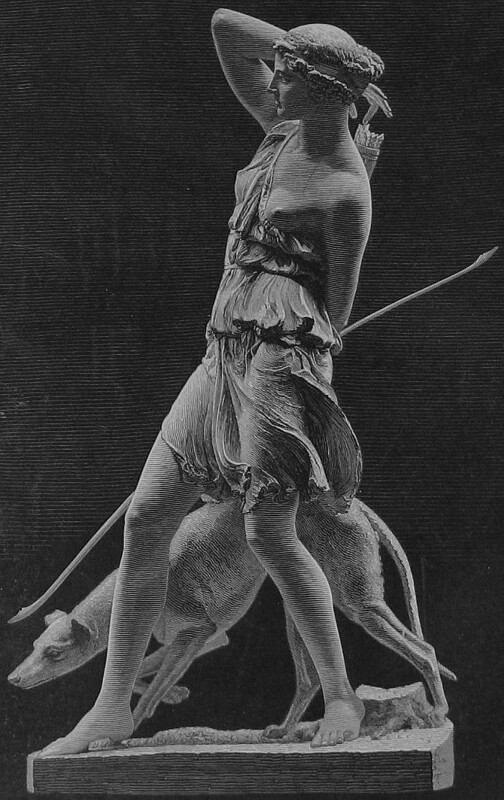 He started sculpture in the studio of his parents, themselves both prominent sculptors (his father, Thomas Thornycroft, sculpted the magnificent Boadicea in her chariot by Westminster Bridge, erected 1902; and his mother, Mary Thornycroft, sculptured portraits of many of the Royal family of the time, especially the children). The young Hamo Thornycroft entered the RA Schools in 1869, and took a trip to Italy in 1871 that greatly influenced his style of work. He became ARA in 1881 and RA in 1888, his Diploma work being a relief called The Mirror . Thornycroft's first major work was his prizewinning A Warrior Bearing a Wounded Youth from the Field of Battle (1875). He is one of the more prolific sculptors of the period, and various of his works are in the major museums and outdoors. In London, his Mandell Creighton is at St Paul's, the Gladstone Monument next to St Clement Danes in the Strand and Oliver Cromwell stands in front of the Houses of Parliament (see the Parliament Square page). His national monument to General Gordon stands in the Victoria Embankment Gardens. Perhaps his most familiar statues, however, are his later ones such as The Mower and The Sower (in Kew Gardens), ennobling and making monumental labour in the fields. Teucer (1881) and The Kiss (1916) were bought under the terms of the Chantrey Bequest and are sometimes on view at Tate Britain. Outside London, The Mower (1884), particularly praised in the Magazine of Art as ‘a noble and complete performance’, may be found at the Walker Art Gallery in Liverpool, and in miniature in the Harris Art Gallery in Preston, in the Ashmolean Museum in Oxford, and elsewhere. We may also note the John Bright (1891) in Rochdale, the excellent and monumental King Alfred (1901) in Winchester (depicted and described on this page), the Boer War Memorial in St Anne's Square, Manchester and the World War I Memorial in Luton, Bishop Goodwin in Carlisle Cathedral, Lord Armstrong for Newcastle, and various sketches in wax and plaster at Reading Art Gallery. Abroad, we may note the Curzon Memorial , and Sir Steuart Colvin Bayley both for Calcutta, India, a King Edward VII Memorial for Karachi, Pakistan, and in South Africa, a young Queen Victoria for Durban. Overall, Thornycroft's most outstanding works are male rather than female, above all the 'heroic peasants' including the Mower , Sower et al, the King Alfred , and portrait statues with real nobility such as his Tennyson and Mandell Creighton in St Paul's and Dean Colet . 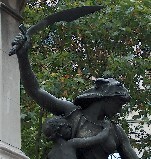 However, he did produce some very good females, of which a personal favorite is the allegorical figure of Courage , one of four surrounding Thornycroft's Gladstone memorial in the Strand, dramatically poised with scimitar to strike off the head of a serpent. Also a full-sized figure called The Joy of Life , dancing in beautiful fine drapes which in their treatment if not their style remind one of metopes among the Elgin marbles, and an angel from a war memorial which may still exist in Durban, South Africa. In his female figures he generally does not aim for either conventional beauty, or a classical treatment of the face. Rather, they are typically dynamic and muscular, athletic figures in action, or poised as if about to move. Courage, from the Gladstone Memorial .